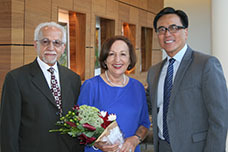 Longtime UCI gastroenterologist Dr. Hooshang Meshkinpour, his wife, Dr. Farzan Naeim, and Dr. Kenneth Chang celebrate the couple's philanthropic gift for digestive disease education and research. UCI gastroenterologist Hooshang Meshkinpour, MD, still recalls his first meeting with Dr. Kenneth Chang. "He came in to interview for a gastroenterology and hepatology fellowship," says Meshkinpour. "It was 1987. We met in Building 53, in the second floor office." Chang was awarded the UCI School of Medicine fellowship. Today, he serves as chief of the UCI Division of Gastroenterology where he trained. Meshkinpour, at age 77, is an emeritus professor who is still providing expert care to UCI patients. He and his wife, retired UCI associate professor of physical medicine and rehabilitation, Dr. Farzan Naeim, have also found rich sources of fulfillment outside the clinical environment. Naeim stepped away from medicine to help the couple’s two daughters raise four grandchildren. The youngest is now eight years old; the oldest started college this year. Meshkinpour discovered a passion for writing. He has published eight book chapters and five books on Jewish history. His latest book, Being Hated: The Anatomy of Anti-Semitism, was printed in 2017. Their latest venture is philanthropy. "We have seen a number of achievements that occurred because of philanthropic contributions from different sources — here at UCI and on other campuses also," says Meshkinpour. "Without that money, they would have been in different shape. If people can afford to contribute, it’s a good Idea. We thought instead of doing this when we pass on, we should do it now and enjoy it." Meshkinpour and Naeim launched their philanthropic endeavors in the summer of 2018 with a gift, the largest made by a faculty member to the UCI Department of Medicine's Division of Gastroenterology and the UCI Health H.H. Chao Comprehensive Digestive Disease Center (CDDC). "We live in Irvine; we love the Irvine community, we are using UCI services, so we should help," says Naeim. "Moreover, we have a long and prosperous connection to UCI. We thought we should start here." Already, their gift is having an impact on digestive disease care. It has allowed the CDDC to acquire an advanced imaging system, adding another dimension to the center's capability to diagnose digestive diseases. The system provides an internal view of the junction between the stomach and esophagus during endoscopic and surgical procedures, which helps to assess swallowing and the movement of food during the evaluation of gastrointestinal disorders. The system improves diagnostic capabilities for achalasia, esophageal dysphagia, eosinophilic esophagitis, gastroesophageal reflux disease (GERD) and other conditions of the upper digestive track. Gastroenterology residents and fellows who are learning the new system will enter community practice with expert training in the diagnosis of these conditions in their patients. "Our division and center take pride in being able to deliver world-class care to the families of Orange County and beyond," says Chang, who also serves as executive director of the CDDC. "This gift is especially meaningful, not only in providing us with the newest technology, but also because it is in the subspecialty area of esophageal motility — an area in which Dr. Meshkinpour is a recognized expert." Meshkinpour and Naeim considered many ways they could support UCI. Ultimately, their confidence in Chang and his vision for the CDDC tipped the scale. "Credit goes to him for being very visionary," says Meshkinpour. "He changed the relationship between gastroenterologists and surgeons at UCI. It is unique in that surgeons and gastroenterologists, despite their differences, are cooperating now. That vision is his. It wouldn’t have happened without him." Meshkinpour and Naeim envision their gift as supporting advances in gastroenterology under Chang’s leadership, primarily through research, education and new scientific equipment. At the same time, it also is an expression of gratitude. The couple moved from Tehran, Iran to Baltimore, MD, for specialty training in 1968. Naeim recalls feeling welcomed from the beginning. It was, she says, easy to conclude they had found a new home. Meshkinpour shares a memory that highlights their introduction to the United States. "When I arrived, a hospital auxillary woman met me at the airport. She gave me her son’s bedroom — he was in Vietnam. She helped me find an apartment to live in, a car. She was instrumental to helping us move forward. "America has been very kind to us," he says. "We want to pay America back." In recognition of the couple’s contribution to the future of digestive health, the CDDC is now home of the Hooshang Meshkinpour and Farzan Naeim Reception Area.